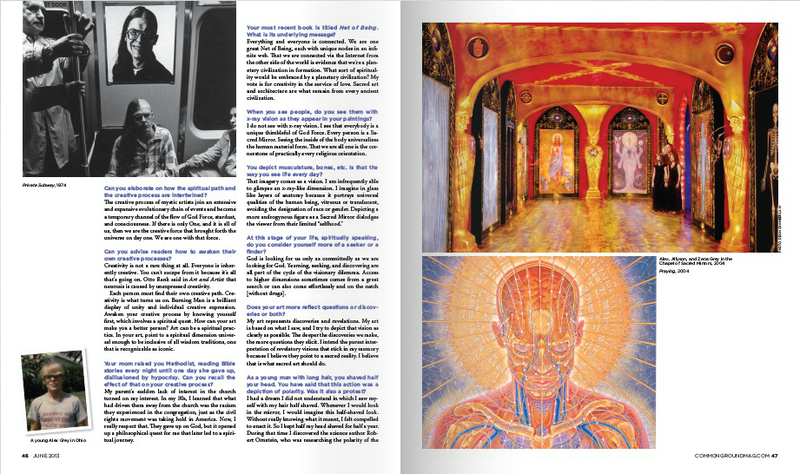 CG: For those who have never heard of Alex Grey, how would you define yourself? AG: I think of myself as an artist and a mystic. The dimensions I depict in my paintings refer to the visionary mystical experience people have encountered through spiritual disciplines and shamanic journeying. The latest resurgence of interest in this phenomenon has occurred in the psychedelic community because visionary experiences are inescapable to anyone who closes their eyes during the psychedelic experience. These dimensions are currently under examination by a huge population of psychonauts. 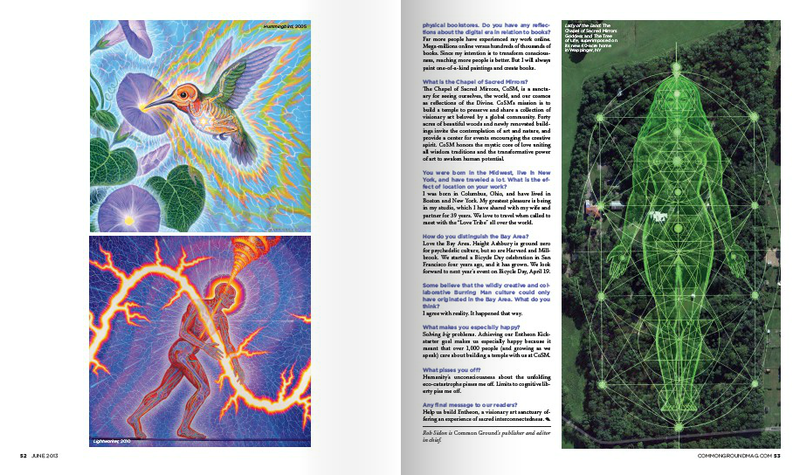 Among them are thousands of visionary artists, attempting to depict these transpersonal dimensions and becoming a movement throughout the world. Considering the world’s sacred art, the Egyptian, Hindu, or Tibetan Buddhist pantheon of archetypes are multi-headed, multi-eyed, multi-limbed, gargantuan, diminutive, inhabiting realms of the visionary imagination. These are beings that exist in an intermediate subtle dimension, dismissed by the general materialist orientation of current American society. CG: This being our creativity edition, might you share your insights as to your creative process? An experience like that must be shared. To honor a vision we can devote creative energy that respects the magic and craft of bringing that vision, a thing of heaven down to earth through discipline and creative practice. Like any meditation except with evidence. I've always admired craft which demonstrates mental focus, mindfulness. 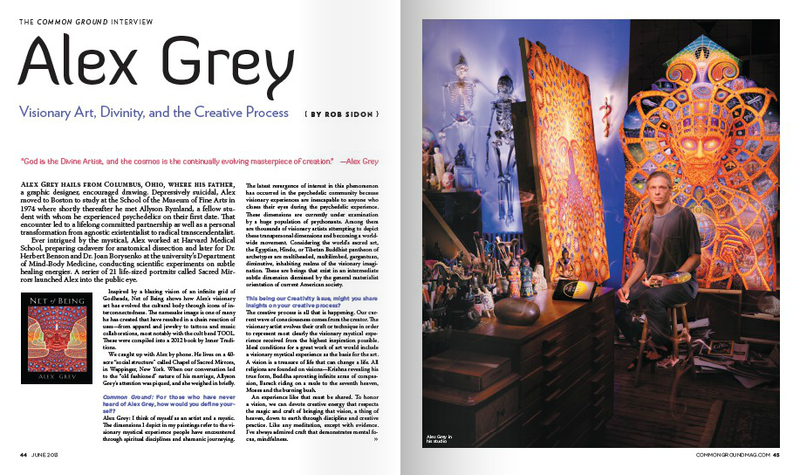 CG: Can you elaborate on how the spiritual path and the creative process are intertwined? AG: The creative process of mystic artists join an extensive and expansive evolutionary chain of events and become a temporary channel of the flow of God force, stardust and consciousness. If there is only One and it is all of us, we are the creative force that brought forth the universe on day one. We are One with that force. CG: Can you advise readers how to awaken their own creative process? AG: Creativity is not a rare thing at all. Everyone is inherently creative. You can't escape from it because it's all that's going on. Otto Rank said in Art & Artists that neurosis is caused by unexpressed creativity. Each person must find their own creative path. Creativity is what turns us on. Burning Man is a brilliant display of unity and individual creative expression. Awaken your creative process by knowing yourself first which involves a spiritual quest. How can your art make you a better person? Art can be a spiritual practice. 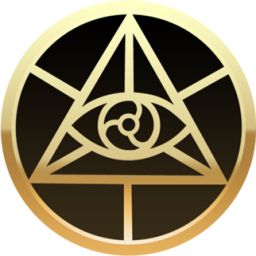 Point to a spiritual dimension universal enough to be inclusive of all wisdom traditions and recognizable as an iconic. CG: Your mom raised you as a Methodist reading Bible stories every night until one day she gave up. Disillusioned by that hypocrisy, can you recall the effect of that trajectory on your creative process? AG: My parent's sudden disinterest in the church turned on my interest. In my thirties, I learned that what had driven them away from the church was the racism they experienced in the congregation just as the civil rights movement was taking hold in America. Now, I really respect that. They gave up on God but it opened up a philosophical quest for me that later led to a spiritual journey. CG: Your most recent book is entitled, Net of Being. What is the underlying message? AG: Everything and everyone is connected. We are one great Net of Being, each unique nodes in an infinite web. Connected via the internet from the other side of the world is evidence that we're a planetary civilization in formation. What sort of spirituality would be embraced by a planetary civilization? My vote is for creativity in the service of love. Sacred art and architecture is what remains from every ancient civilization. CG: When you see people, do you see them with x-ray vision as they appear in your paintings? AG: I do not see with x-ray vision. I see that everybody is a unique thimbleful of God Force. Every person is a Sacred Mirror. Seeing the inside of the body universalizes the human material form. That we are all One is the cornerstone of practically every religious orientation. CG: You depict the musculature, the bones, etc. Is that the way you see life every day? AG: That imagery comes as a vision. I am infrequently able to glimpse an x-ray-like dimension. I imagine in glass like layers of anatomy because it portrays universal qualities of the human being, vitreous or translucent, avoiding the designation of race or gender. Depicting a more androgynous figure as a Sacred Mirror dislodges the viewer from their limited '"selfhood." . CG: At this stage of your life, with regard to spirituality, do you consider yourself more of a seeker or a finder? AG: God is looking for us only as committedly as we are looking for God. Yearning, seeking and discovering are all part of the cycle of the visionary dilemma. Access to higher dimensions sometimes come from a great search or can also come effortlessly and on the natch. CG: Does your art reflect more questions or discoveries or both? AG: My art represents discoveries and revelations. My art is based on what I saw and I try to depict that vision as clearly as possible. The deeper the discoveries we make, the more questions they elicit. I intend the purest interpretation of revelatory visions that stick in my memory because I believe they point to a sacred reality. I believe that is what sacred art should do. CG: As a young man, you shaved half your head and kept your hair long on the other half. You have said that this action was a depiction of polarity. Was this also a protest? AG: I had a dream I did not understand in which I saw myself with my hair half shaved. Whenever I would look in the mirror I would imagine this half-shaved look. Without really knowing what it meant, I felt compelled to enacted it. So, I kept half my head shaved for half a year. During that time I discovered the science author Robert Ornstein who was researching the polarity of the hemispheres of the brain. This hemisphereic split, portrayed in my haircut, had me thinking about the intuitive than the rational polarities of personality. The subject of my art examined life and death. spirit and matter, etc. These polarities represent constructs within which we are defined. What's acceptable for a man? What's acceptable for a woman? An adult? A child? Thoughts of boundaries and polarities pervaded my mind. I had just become a new student in a new city and my alien appearance, no doubt, reflected a feeling of alienation in polar contrast with a desire to stand out. to emerge. After shaving half my hair, nobody in art school wanted to talk to me. Only one person asked me why I did it and that was Allyson. We were in a conceptual art class together. That class changed our lives. CG: Wasn't that a time that you were also depressed, even suicidal? AG: Yes. Polarities maintain a dualistic and unhappy reality. Exhausted with life at the age of 21, I challenged God, "If you exist, give me a sign before I end it all." Within 24 hours I had taken my first LSD trip and found true love in Allyson. We never left after that night 39 years ago. CG: You enrolled at Harvard Medical School; why did you want to become a medical doctor? I never enrolled in Harvard Medical School or wanted to be a doctor. I was employed at Harvard Medical School in the Department of Anatomy -- in the morgue, accepting donations of physical remains and preparing them for dissection, and in the Warren Anatomical Museum preparing exhibits on the history of medicine and disease. I also worked briefly in the Department of Behavioral Medicine with Dr. Herbert Benson (The Relaxation Response) and Dr. Joan Borysenko (Minding the Body, Mending the Mind) as a lab assistant experimenting on the possible benefits of remote healing. CG: What’s is the effect of fame? AG: People are interested in what you have you have to say. CG: Tattoos. Hundreds of people have indelibly replicated your art onto their bodies. How does that make you feel? AG: Honored to see my work embodied by a generation. 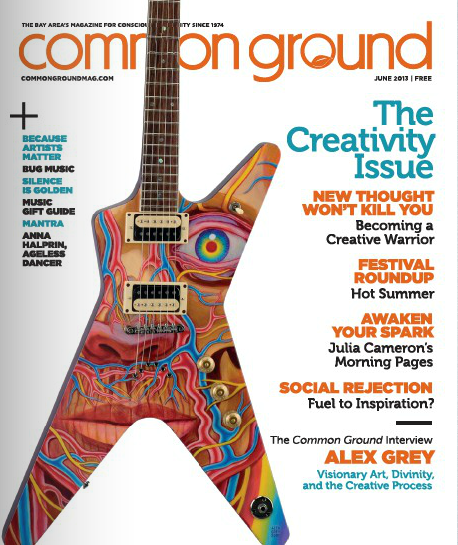 CG: You’re an icon among the psychedelic community; do you have a message—cautionary or otherwise-- to particularly young people, about drug experimentation? AG: The highest function of psychedelics is their use as a sacrament. The foundation of both Easter and Western civilization, that is Hinduism and the Greek culture, were based on sacramental rites using a mind-altering substance to connect the pilgrim with divine reality. Psychedelics are powerful tools for accessing the highest and deepest dimensions of consciousness. These sacraments should be used with the utmost caution within a sacred mindset and in a sacred setting. Those with any history of schizophrenia and borderline personality can potentially become impaired by the use of these substances. In the proper context with trained support many breakthroughs are being made in mental illness, especially PTSD, cluster headaches, palliative care, through new treatments using psychedelics. CG: Your work has been known principally via books—you’ve sold many—particularly for an artist. It seems that metaphysical bookstores were the predominant places people discovered you, but those are something of a dying breed—as are books in general. Do you have any reflections about these shifting trends and the digital era? AG: Far more people have experienced my work online than in books or anywhere else. Mega-milions online versus hundreds of thousands of books. Since my intention is to transform consciousness reaching more people is better. But I will always paint one-of-a-kind paintings and books. CG: Speak about your relationship with your wife, Allyson. Your connection seems to be profoundly rare and constructive.Is Allyson more of a muse or a collaborator? And what does the word “muse” mean to you? AG: Meeting divine love in the flesh meant that I was not interested in killing myself anymore. Love potentially existed. There was somebody who I suddenly cared about. Suddenly, I have a meaning for existence. Fate had me standing on the street corner for a couple of minutes when Allyson drove by to invite me and our professor to her end of the school year celebration. That professor provided me with my first LSD trip in a bottle of Kahlua that I shared with Allyson that night. We've shared a studio for 39 years, first in Boston and for 28 years in Brooklyn. We inspire each other's work and are a muse for each other. Allyson's work is extraordinary and it has been a privilege to watch it unfold and be part of that process all these years. Right now, I am completing a painting entitled "Kiss of the Muse." The Sacred Mirrors were inspired by Allyson and she also came up with their name. Allyson is my best advisor on all subjects. She's my spiritual teacher, and soul mate. I am very blessed. Our love and mutual respect has given us a foundation to have a family and a spiritual community. Today more than ever, sexual balance and successful partnership represents transformative possibilities. CG: For most people, marriage is an overwhelming challenge, hence the high divorce rate. What can you tell us about relationship? AG: If the divorce rate is 50% or so, that leaves quite a few couples that do stay together. Being a committed couple, we meet many other committed couples. Communication is, of course, essential. Betrayal disappoints the hopes and expectations in a relationship and is the lowest level of unconsciousness. Some partners act out their own deep seeded psychological problems, expecting their mate to fulfill some deficit. Noticing our responsibility in every conflict and developing compassion for another are both opportunities for personal betterment. A committed partner is a Sacred Mirror and seeing ourselves in the face of love helps us to be the best we can be. If a partner is not in your life it can still be an awesome adventure. Life is a gift, everyday. Love is a possibility and a story we tell ourselves and others. We author our story.We can be creative and tell the story however we choose. CG: Is yours about just a hard-driving truth? Is that sort of the cornerstone of your relationship, just sheer truth, nothing but the truth? Committed to truth in relationship? AG: Yeah, pretty merciless truth... willing to hear the truth and to share deeply in the context of love and healing, a path of transformation. CG: Of the great painters of our time, who have been your greatest influences? Jean Delville, Pavel Tchelitchew, Jackson Pollock, Mark Rothko, Ernst Fuchs, Mati Klarwein, all of them mystics. CG: Well, you mentioned a Rothko and such, think of Picasso, take any of the Impressionists. The great masters, do you think spirituality is imbued in that or great technique? Great vision, great skill, great gift. AG: God is both the highest rung of the ladder and the entire latter. There are many approaches by different schools of artists. Creative manifestation is a wave of creative expression that pushes it's way through culture during a particular "time sausage." Culture is like a gumbo with lots of different elements occurring concurrently. An artist emerges from this creative stew and gives rise to a particular individual vision. The individual floating in this gumbo of time within this given time sausages is also an individual node evolving toward enlightenment. As they evolve, their souls offer expanded aliveness and creative possibilities. Creativity is the handmaiden of love. Art intended as a spiritual practice is the highest aspiration. Marrying the practice of spirituality and creativity gives us a record of our own states of awareness that point heavenward. CG: How do you feel about polyamory or open relationship? Are you progressive or old fashioned in this regard? AG: Allyson and I never went the route of polyamory because we were committed to each other and we weren't really that curious. We've seen many friends crash their relationship and just weren't interested. We have other things to do and a lot to accomplish. The continual polyamory drama holds no attraction and seems more like a distraction. Few polyamorous relationships last. People choose different paths. There's no right or wrong. If you want to shop around, go polyamorous. If you want to be with your best friend in your old age, we recommend working on one relationship. CG: So you’re old- fashioned about that. AG: The label "old-fashioned" is pejorative. Monogamy will always be a choice that will be accepted by some and rejected by others. Allyson and I met each other on LSD and could be Norman Rockwell's couple next door. Allyson: Our commitment to each other elicits trust in others. We aspire to build a temple and would like a community to join with us. AG: Building a sacred space is the job of a sacred community that shares basic truths and feels united as a tribe. Allyson: A committed relationship can support a creative life. When we answer to a higher calling, something of service, something of noble purpose, betrayal and seeking love elsewhere can seem trivial. CG: I look at the precedent of artists and musicians. They're not the pinnacle of fidelity. Allyson: Infidelity is very common, of course. Being extraordinary is transformative. AG: Finding common ground means finding unity in all humanity, in the ecosystem and in the cosmos. CG: You are all committed to truth but don't little convenient white lies get you through? Allyson: You want to know how much sin we could live with? That's a very good question we all have to ask ourselves. Do Alex and I ever fight? Yes. We are working on ourselves, imperfect in many ways, falling short quite often and working on ourselves. That's a common ground. CG: Sometimes don't we have to be judicious about the truth? AG: Sometimes we think there are things we shouldn't talk about, things we shouldn't share with our mate. Look at how much of our behavior is ruled by this thing we can't share with the person closest to us. That’s a question every person must live with. I intend as much transparency as possible. The element of trust is pretty essential to a successful relationship. CG: What is the Chapel of Sacred Mirrors? AG: The Chapel of Sacred Mirrors, CoSM, is a sanctuary for seeing ourselves, the world, and our cosmos as reflections of the Divine. CoSM's mission is to build a temple to preserve and share a collection of visionary art beloved by a global community. Forty acres of beautiful woods and newly renovated buildings invite the contemplation of art and nature, and provide a center for events encouraging the creative spirit. CoSM honors the mystic core of love uniting all wisdom traditions and the transformative power of art to awaken human potential. AG: I was born in Columbus, Ohio and have lived in Boston and New York. My greatest pleasure is being in my studio which I have shared with my wife and partner for 39 years. We love to travel when called to meet with the "Love Tribe" all over the world. CG: How do you distinguish the Bay Area? AG: Love the Bay Area. Haight Ashbury is ground zero for psychedelic culture, but so is Harvard and Millbrook. We started a Bicycle Day celebration in San Francisco four years ago and it has grown. We look forward to next years growing event in San Francisco on Bicycle Day, April 19, 2014. CG: Some believe that the wildly creative-collaborative Burning Man culture, could only have originated in the Bay Area; what do you think? AG: I agree with reality. It happened that way. CG: What makes you especially happy? AG: Solving BIG problems. Achieving our Entheon kickstarter goal makes us especially happy because it meant that over 1,000 people (and growing as we speak) care about building a temple with us at CoSM. CG: What pisses you off? AG: Humanity's unconsciousness about the unfolding eco-catastrophe in progress pisses me off. Limits to cognitive liberty piss me off. CG: Any final message to our readers? AG: Help us build Entheon, a visionary art sanctuary offering an experience of sacred interconnectedness.